Parkinson’s UK started the The Get It On Time campaign in 2006 to ensure everyone in a care home or hospital gets their medication on time, every time. Parkinson's is a degenerative neurological condition, for which there is no cure at present. It affects 145,000 people in the UK – around one in 350 of the adult population – and the main symptoms are tremor, slowness of movement and rigidity. The timely delivery of medication can be as crucial in managing Parkinson’s as insulin is for those with diabetes. But the latest audit from Parkinson’s UK, carried out in 2017, shows that fewer than half of people admitted to hospital always got their Parkinson's medication at the right time. Timely access to medication is essential in Parkinson’s; without medication, people with Parkinson’s can lose their ability to manage their symptoms and someone can go from being mobile and articulate to unable to move, get out of bed or speak. The difference between these medicated and unmedicated states is often referred to as being ‘on’ or ‘off’. Not getting medication on time can also have long-term implications – we have heard devastating stories of people permanently losing the ability to walk after a hospital stay. For those who do recover, it can take months before they feel in control of their symptoms again. Guidelines from the National Institute for Health and Care Excellence (NICE), published in July 2017, recommend that adults with Parkinson's disease have regular access to a continuing point of contact for support, which could be a Parkinson’s nurse specialist. Previous NICE guidelines stated that Parkinson’s nurses should have a maximum of 300 patients on their caseload, but we know that many have more than 500 patients, even up to 1,000 in extreme cases. Access to specialist Parkinson’s nurses on wards and in the community is becoming increasingly difficult, which is why it is so important that all healthcare staff are supported in their management of patients with the condition. The Get It On Time campaign remains as important as ever. At Parkinson’s UK, we continue to raise awareness of the campaign among people affected by Parkinson’s and the general public, and we also want to support healthcare professionals to understand the condition. The UK Parkinson’s Excellence Network was established in 2015 to bring together professionals working with people affected by the condition, to share best practice. Our online learning hub offers free training programmes for professionals to improve the quality of care for people affected by Parkinson's. Resources cover a range of topics, including medication, and nurses can also find guidance on subjects such as treatments, symptoms and patient involvement. Once awareness of the importance of timely medication is in place, nurses can play an important role in spreading the word. This is where our free Get It On Time materials, including posters, stickers and a clock, can help. As well as improving patient health, introducing initiatives like these helps reassure patients and their families, and can boost positive feedback to staff. Implementing medication management initiatives has also led to awards for several healthcare teams. In 2018, two services received UK Parkinson’s Excellence Network Awards in recognition of their outstanding efforts in medication management. In the UK, two people every hour are told they have Parkinson's. 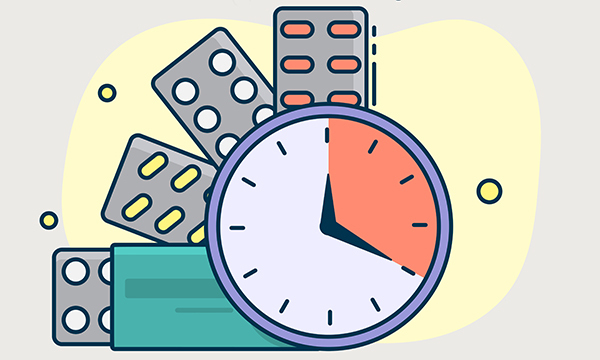 Getting their medication on time, every time, is vital to their health and well-being. All nurses and healthcare teams can play their part in ensuring this happens.